During the months of October and May on Monday lunchtime from 12.40pm all students and staff from both Upper and Lower School are invited to attend the Chapel to say the Rosary. This year we have been a small group and each week we pray all 5 Decades of the Rosary. During Lent on Monday lunchtime from 12.40pm all students and staff from both Upper and Lower School are invited pray the Stations of the Cross in the Chapel. Those who attend play a full part by each taking the lead to read to the others about each individual station. During October all staff and students receive a card to ask if they wish to put the name of a deceased family member, loved one or friend on to a Remembrance List. A list is then created for each year group which is used during November in their year group assembly. The staff list is prayed during November at morning prayer, which takes place in the Chaplaincy room at Upper School and in the Chapel on Monday lunchtime at Lower School. Each year to mark our schools Feast Day we have a whole school Mass in York Minster. This is usually held as close to the 1 November as appropriate. The Mass is attended by all staff and students and many students take an active part by reading and singing. On the first Monday in Advent each year we have an Advent Service in York Minster. This is always very well attended by our staff, students and Governors. We are extremely lucky to have the use of the Minster for two such important occasions and we are very grateful to the Dean and Chapter of York Minster. 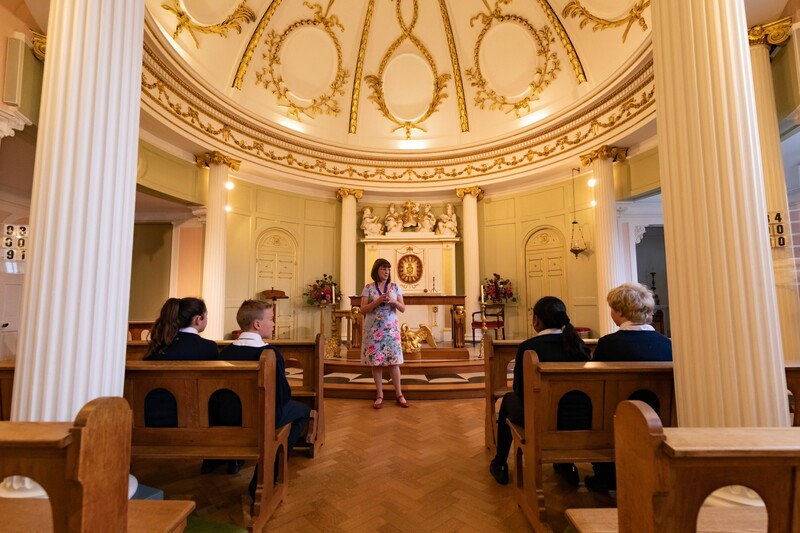 On the morning of the final day of the academic year, Year 9 have their Leavers’ Mass in the Lower School Hall and the remainder of the school have Mass at English Martyrs to celebrate the end of year and to mark their achievements. At the end of each term a Mass to mark the end of the term takes place in the Chapel. Leavers’ Masses take place for years 11 and 13 during their final few weeks in school. Year 11’s usually take place on a Friday morning and year 13 are held on a Wednesday evening, close to the spring half term break, with a reception afterwards. To celebrate their time at the Lower Site, year 9 have a Leavers’ Mass in the Lower School Hall on the final morning of the summer term in readiness for them moving into the Upper Site in September. Our retreat programme for Key Stage 3 students, provides an opportunity for students in Years 7, 8 and 9 to spend at least half day in their forms – away from school – to discuss, reflect and pray together. This time to reflect is organised and led by the RE & Chaplaincy Department with support from the YOYO Trust for Year 9. At the end of Year 10 we take students to the Retreat Centre at Ampleforth Abbey for a two-day residential Retreat, which is led by All Saints staff. This gives students the chance to take a "half-time break" in their GCSE studies, and give them the opportunity to think, share, reflect and pray about the years ahead. Similar one-day and/or residential opportunities are also available for Sixth Form students, according to demand. Years 9, 10 and 12 are offered the opportunity to take part in a seven day pilgrimage to Lourdes every Summer Half Term. Students assist the supported Pilgrims to attend Mass, take part in alter servicing and assist priests with anointing the sick. They also get to experience the spiritual and uplifting feel of the grotto and Holy waters. It offers a very peaceful and reflective journey for our students and those who participate greatly appreciate their experience. These pilgrimages are organised by our Chaplaincy Co-ordinator Miss E Wright.